Mrs. ReaderPants: New School Librarian? NEW SCHOOL LIBRARIAN? HELP IS HERE! Truly, library school doesn't teach you about 95% of what you need to know as a school librarian. So, I've decided to dedicate a section of this blog to all the new librarians out there. Please know that the struggle is real. It isn't you; it's all of us. We've all been there, and we're here to help. 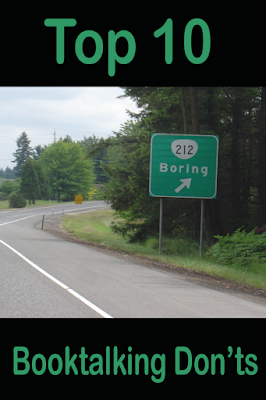 Being a new school librarian is fun, exciting, exhausting, overwhelming, and even lonely at times. In your first few weeks, you will probably feel all of these emotions, possibly at the same time. As you look around the library, you see so many things that need to be done. Who do you go to with questions? What questions should you ask them? What needs to be done first? Here's a to-do list of the top ten things you need to do and think about before you deal with any new bulletin boards, displays, or even lesson planning. In looking through my draft blog posts from the past few months (I am terrible about starting things and not finishing! ), I found this little gem about my first days in my new school library. I just got busy and never polished it up for posting. Four months later, I am having a chuckle at my advice for new-to-their-school librarians. All of this is soooo accurate! In fact, I am still dealing with some of these issues four months later. So instead of saving this great information for the start of next school year, I am instead posting it in December. Some of you may be starting new school library jobs in January. And some of you may be like me and still dealing with new-to-you library issues. It is my hope that this article can help give you focus and perspective in the new year. 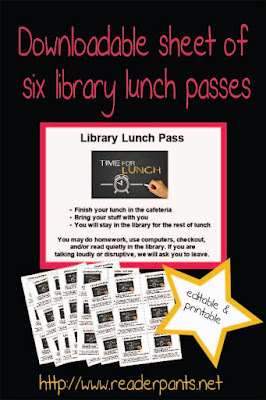 Need a new system for student library visits during lunch? Lunch in the library can be a crazy time, maybe too crazy! As a middle school librarian, I have tried lots of ways to manage my lunch crowd. Some worked, some didn't. In this post, I share what did finally work for me, as well as printable/editable lunch passes that you can download free. Today, I am going to share what my school did to celebrate the Texas Lone Star Reading List, as well as some ideas I haven't tried yet. These ideas could be adapted to any reading list. 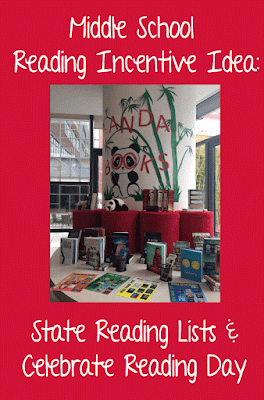 This reading incentive plan is very generic and can be adapted to any state, district, or school reading list. 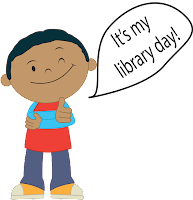 It will work for any age of readers as well, provided you want to put together a "Celebration Day" at the end of the school year. 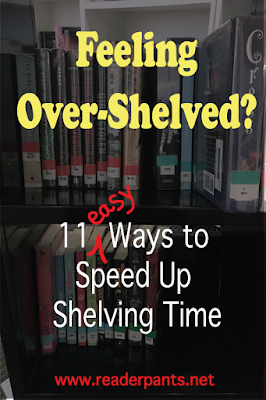 Why do elementary students get to enjoy library every week, but middle school students depend on their teacher to schedule time in the library? Why? There's an episode of Seinfeld where George asks Newman why postal workers "go postal." And Newman starts freaking out, shouting about how the mail never stops; it just keeps coming and coming and coming...! I see shelving library books the same way Newman sees the daily mail. The books keep dropping into the book return. Boom, kerplunk, thud! It never stops!!! Argh! Can't login. Can't print. New student needs a login. Computer frozen. Mouse roller ball is missing. Printer is out of paper. Something is stuck to the mouse pad. The battery is dead. The R and F keys are reversed. Sound familiar? Help! 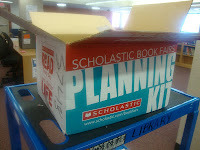 It's Book Fair Time! 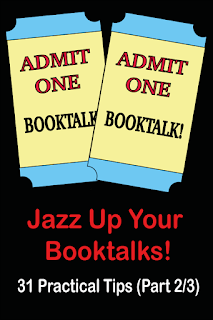 Want to run a book fair AND keep your sanity at the same time? It is possible, but you've got to get organized. Here are some things I've learned from running far more book fairs than I want to think about. You're welcome! 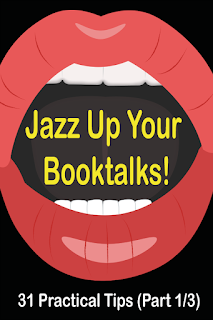 Looking to up-your booktalking game? 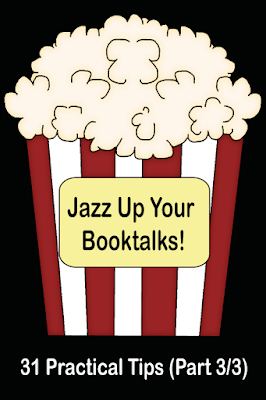 Here are 31 tips and 10 Don'ts that will help make your booktalks fabulous! I don't recommend trying to implement a lot of them at once. Pick one or two and give them a try this week! I Want My DQA (Destiny Quest App)! If your library uses Destiny Quest, you have to try the Destiny Quest App! 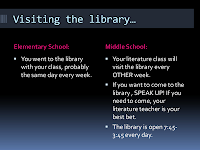 A few videos I've used for library orientations at the beginning of the year. I get bored with orientation, so I like to show different videos to different groups. I work at a small special education school and I'm working on setting up a library system for us. Right now, there is NOTHING in place. Each classroom has bookshelves with a few hundred books but there is no catalogue or way to keep track. I've started cataloging the books in my own classroom via Librarika. I haven't even begun barcoding, and right now I have lower level readers and picture books organized by genre, novels organized by author. Although we have no dedicated library space, I think our school is capable of a better system. Right now I'm advocating to have ALL the books catalogued and tagged with a room number. I was wondering if you have any tips for book organization starting from scratch. What kind of information should I have on my barcode stickers? How can I organize picture books? Magazines? I have so many questions!